The White House said the IRGC was Iran's primary means of "implementing its global terrorist campaign". The measure will take effect in one week's time, according to US Secretary of State Mike Pompeo. Mr Pompeo said the US will continue to sanction and pressure Iran to "behave like a normal nation" and urged US allies to take similar action. Labelling the IRGC as a terrorist organisation will allow the US to impose further sanctions - particularly affecting the business sector, given the IRGC's involvement in Iran's economy. Mr Pompeo and National Security Adviser John Bolton were reportedly in favour of the move, but some Pentagon officials, including Joint Chiefs of Staff Chairman Gen Joe Dunford, have expressed concerns, the Wall Street Journal reported. 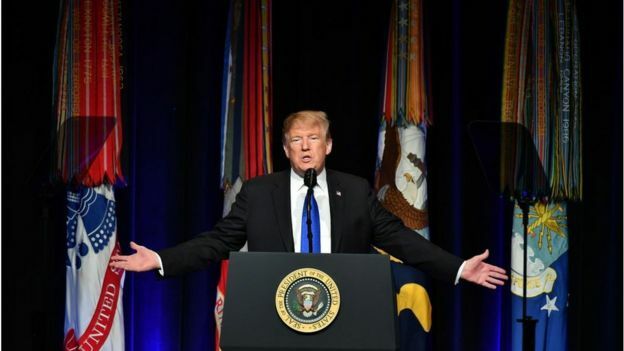 Military officials cautioned that the designation could incite violence against US forces in the Middle East without severely impacting Iran's economy. The Central Intelligence Agency (CIA) had also reportedly opposed the move. "We will answer any action taken against this force with a reciprocal action," a statement issued by 255 out of the 290 Iranian MPs said, according to the Islamic Republic's state-run IRNA news agency. The IRGC was set up shortly after the 1979 Iranian revolution to defend the country's Islamic system, and to provide a counterweight to the regular armed forces.